This will make into a great quilt . . . These are so fun! I can absolutely see why you took a ghastly turn!! 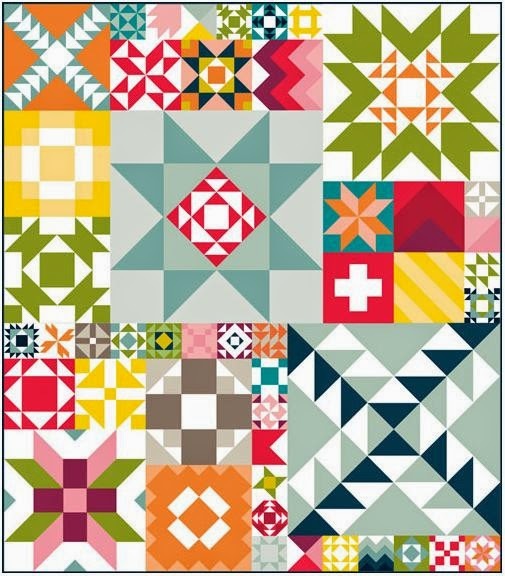 I already have been wanting to make the quilt you are now working on, and I LOVE your fabric choices too...might just be ordering the pattern cards after all! I've had my eye on that Ghastlie fabric but didn't know what to do with it. Oh what fun! Love it. I love thte colorful Halloween blocks! Did you notice the triangle that is turned in the last block? Or was it on purpose? I can see why you got distracted by this project. It looks like a lot of fun. Amazing how the different colors build such totally different views. Very fun looking squares. These are turning out so great! The colors are fun. That was a good idea. Very fun blocks! I think you win in the Perfectly Pieced Points category. They are all stupendous! I need to get my link up here for the circles. Soon. I love how you're using the Ghastlies fabric! Your blocks are wonderful, it's going to be such a fun quilt! Good ideas for great blocks! And thanks for the party! I love it with the ghastly theme!! Lol!! I"ve enjoyed watching this on IG...such a great idea. It's got just enough novelty fabric to get the idea without making it so "themey" as most halloween quilts seem to be.